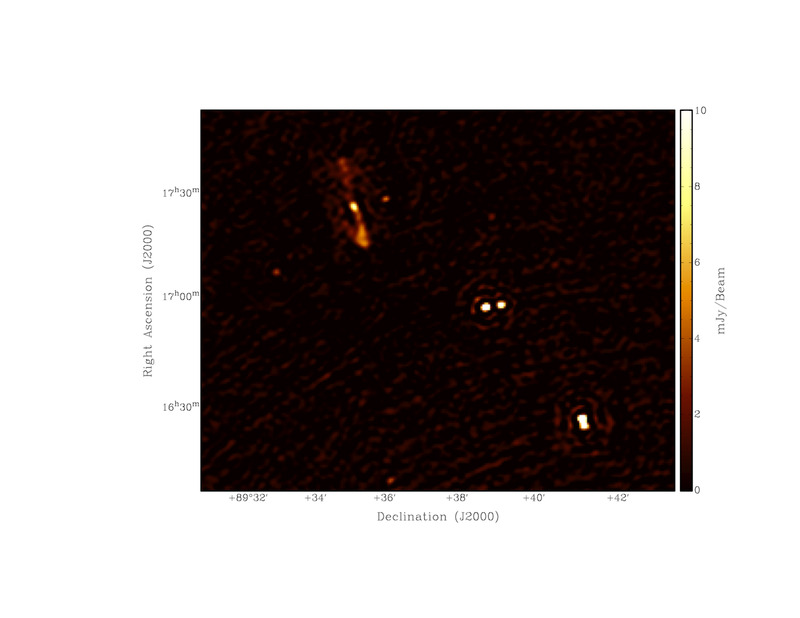 The below press release was posted at ASTRON today describing some very deep images taken by LOFAR as part of the commissioning for the Epoch of Reionization project (the part of LOFAR which is trying to look for evidence of the first stars turning on). See the press release on the ASTRON website (copied below). 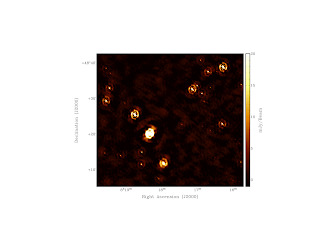 An international team led by astronomers at ASTRON and the Kapteyn Institute of the University of Groningen have used the LOFAR telescope, designed and constructed by ASTRON, to make the deepest wide-field images of the sky in the relatively unexplored part of the spectrum around 150 MHz. It reveals faint radio sources never seen before. The results were presented at an international conference in Zadar, Croatia, last week (May 23-27, see http://www.astron.nl/FGC2011) and were eagerly awaited by the astronomical community. The Zadar conference (organised by team member dr. V. Jelic, ASTRON), discussed the properties of the foregrounds that trouble our view of the distant Universe. Two projects were central at the conference: Planck observations of the Cosmic Microwave Background and (searches for) redshifted 21cm line observations of an era known as the Epoch of Reionization (EoR). This phase in the Universe is believed to have taken place in the period between about 400 and 800 million years after the Big Bang. The birth of the Universe took place about 13.8 billion years ago. During the EoR the neutral hydrogen was slowly disappearing, probably as a result of the strong 'ionizing' power of the first stars and quasars. Detecting the EoR is one of the hottest projects in astronomy today. A group of astronomers based at ASTRON and the Kapteyn Institute of the University of Groningen, headed by Prof. Ger de Bruyn, Dr. Michiel Brentjens, Prof. Leon Koopmans and Prof. Saleem Zaroubi, is in the race to first detect these signals. They lead a team of about a dozen members, including astronomers currently working in Germany, USA, Canada and Sweden (see http:/www.astro.rug.nl/~LofarEoR). The results presented at the conference constitute an important step on the road to detecting the elusive signals. However, there is still a long way to go along this road. Most of the antenna stations of the International LOFAR Telescope have already been rolled out across the Netherlands and Europe. It has been taking data for a large number of astronomers after its official opening by Her Majesty queen Beatrix of the Netherlands last year. 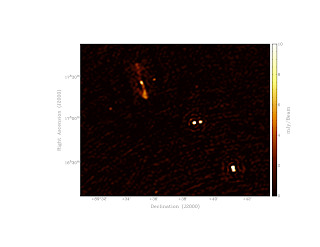 The LOFAR data on which the images are based, were obtained in a 6-hour synthesis on the night of 29/30 January 2011 and the evening of 1 April 2011 using 18 core stations and 7 remote stations. Signals were recorded with the High Band Antennas and covered the frequency range from 115 - 163 MHz. After initial processing on the central LOFAR cluster they were transferred and further processed on a cluster dedicated to the processing of data for the LOFAR Epoch-of-Reionization project. This cluster is also located at the Computing Centre of the University of Groningen. Cutouts from a very small part of the giant images are shown in the associated figures. One of the fields is centered at the celestial North Pole which is special in the sense that night-time observations can be obtained all year round. The second field was centered at the bright compact quasar 3C196 in the constellation of Lynx. The images, which have a resolution of 8" are already comparable to, or even slightly better, than the best published images taken with the Giant Meter Wavelength Radio telescope (GMRT) in India. The images contain a large number (>1000) of both very bright and very faint sources, spanning a so-called dynamic range of more than 200,000:1 in brightness between sources in the 3C196 image. by Dr. Panos Labropoulos on the EoR-cluster at the University of Groningen. This is an important record for the time being for LOFAR. The image quality, however, is still not perfect and significant improvements can be expected in the months ahead using improved knowledge of the effects of the LOFAR station beams. Continued efforts are also needed to improve the software to deal with imaging artefacts and the ionosphere. These two fields and several others will be observed for about 100 nights to conclusively detect signals from the EoR. The results, and their implications, will soon be written up in two papers headed by Dr. Panos Labropoulos (ASTRON) and Dr. Sarod Yatawatta (ASTRON/ RuG) who lead the processing of the datasets for the 3C196 and NCP fields, respectively. 3C196-Panos: A very small part of the raw LOFAR image of the field centered on the bright quasar 3C196. It  shows tens of discrete sources, the faintest having a flux density of only a few mJy at 150 MHz.The image has an angular resolution of 8 arcseconds. The image still needs to be deconvolved. The data was processed by Dr. Panos Labropoulos on the EoR-cluster at the University of Groningen. The data were obtained as part of the commissioning of LOFAR and the results obtained thus far are a tribute to the hard work of a large group of people, usually referred to as the LOFAR collaboration. The International LOFAR telescope is a Pan-European collaborative project led by ASTRON Netherlands Institute for Radio Astronomy. Combining thousands of simple dipole receivers with powerful digital signal processing and high-performance computing, LOFAR can rapidly survey wide areas of the sky, looking in multiple directions simultaneously and relatively unexplored low frequencies, opening open up a new window for astronomers. 1. The Epoch of Reionisation - understanding how the first stars and black holes made the universe hot. 2. Extragalactic surveys - what is the history of star formation and black hole growth over cosmological time? 3. Transients and Pulsars - probing the extreme astrophysical environments that lead to transient bright bursts in the radio sky. 4. Cosmic rays - what is the origin of the most energetic particles in the universe? 5. Solar and space environment - mapping the structure of the solar wind, how it relates to solar bursts, and how it interacts with the Earth. 6. Cosmic Magnetism - what is the origin of the large-scale magnetic fields that pervade the universe? See also www.astron.nl and www.lofar.org.